Rep. Carol Hall, leading the school safety working group Tuesday. With pressures inflicted in part by social media shaping a distinct, rapidly evolving generation of students, a largely-Republican group of lawmakers is looking to update the school safety reforms implemented in the wake of the 2012 Sandy Hook Elementary School shooting. 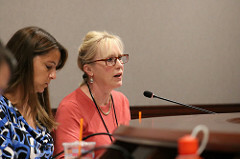 The lawmakers formed a school safety working group, led by Rep. Carol Hall, R-Enfield, and have been meeting with statewide education organizations since April, gathering information on the current climate of today’s schools and hearing suggestions about how to improve school security in Connecticut. Following the Sandy Hook tragedy in 2012, the state implemented a number of legislative reforms centering on school safety. The state began offering a grant program to schools for the implementation of safety infrastructure, such as security cameras and bullet-proof windows, as well as mandating education boards in each district to submit their schools’ annual safety procedures to the Department of Emergency Services and Public Protection (DESPP), among other requirements. But at least some elements of the reforms did not progress as smoothly as envisioned, with the majority of school districts continuously failing to turn over their safety procedure reports to DESPP. The reforms have also remained unchanged since their inception in 2013. Hall says the committee aims to evaluate school safety in various districts on a continual basis, identify best practices for security, and accumulate ideas to carry over to the 2019 legislative session. “In order to keep on the cutting edge for our districts, we needed to have a working group to re-evaluate the legislation that got passed after Sandy Hook, to see what’s working, what’s not working. We try to get feedback from every aspect of our communities that are involved in our schools,” she said. Rep. Christie Carpino, R-Cromwell, serves as the vice-chair of the group. At least one Democrat, Rep. Dorinda Borer, D-West Haven, maintains involvement in the group, but the rest of its members, based on a meeting it held with state education leaders on Tuesday, appear to be predominantly Republican. “A number of members expressed interest in addressing these issues,” O’Neill said. At a press conference in April — not long after the school shooting in Parkland, Florida — Republican caucus members announced that they were moving forward with examining school safety. O’Neill said that both Republicans and Democrats were invited to attend the meetings. Its gathering Tuesday engaged about a dozen representatives in a round-table, question-answer format discussion with various leaders of educational organizations. The focus weighed heavily on mental health. “In recent years, it’s an interesting balance between trying to fortify a school and keep it structurally and physically safe while at the same time, understanding the challenges that exist … social and emotional … of our students,” said Glenn Lungarini, executive director of the Connecticut Association of Schools and the Connecticut Interscholastic Athletic Conference. Lungarini noted that, while implementing safety infrastructure such as metal detectors in schools may benefit some districts, the state must take a very incremental and discrete approach, considering the emotional consequences such drastic changes may yield for students. The working group also explored the idea of emergency action plans, or detailed instructions of what to do in various dangerous situations, for after-school activities. Lungarini said that coaches have access to modules providing information on emergency responses during after school sporting events, though not many districts have taken further steps to finalize detailed plans. “Most schools have had conversations about it. I wouldn’t go so far as saying most schools practice it,” he said. Lungarini was joined by Connecticut Association of Boards of Education Deputy Director and General Counsel Patrice McCarthy and Connecticut Parent Teacher Association President Jennifer Falotico. Within these separate discussions, one theme emerged: human connection is at the heart of school safety. “Developing relationships within the school is key,” McCarthy said. She stressed the crucial role of teachers in identifying warning signs in students, but outlined the challenge of establishing these relationships in the midst of consistent budget cuts that deplete schools of staff members. Falotico also honed in on relationship building, urging work group members to take a more “boots on the ground approach” when it comes to forming relationships with the community and parents. For Lungarini, the relationship building starts at home.